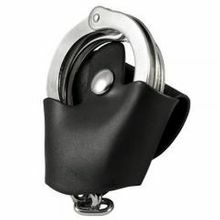 Made by Boston Leather this cuff case will hold one pair of handcuffs securely, yet allow you to yank them into action immediately with one hand. Made of plain black leather with a nickel snap. Model 5520-1 fits a 1 3/4 inch Garrison Belt with a nickle snap. Model 5520-1 Garrison Black has a black snap. Model 5521-1 fits a 2 inch Duty Belt and is plain black leather. 5521-3 is Basket weave.